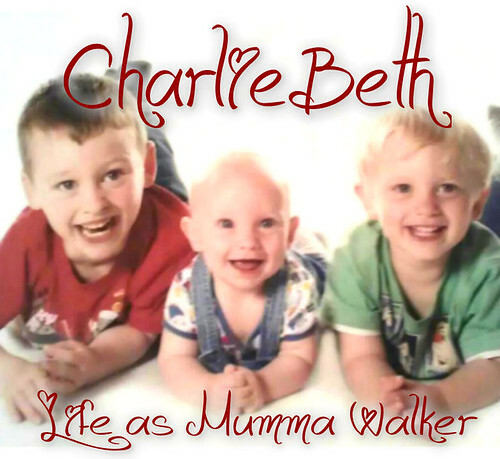 Mumma Walker's 7 Years of Pregnancy by CharlieBeth: BIRTH STORY! 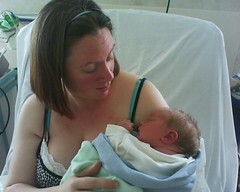 So I had an induction booked for 8am on June 2nd 2010, 3 days before my due date. I wasn't too thrilled at the prospect, having been battling with my (rude and unprofessional) consultant all the way though this pregnancy. She wanted me to have a c-section or induction before she'd even MET me... But 3 days early isn't a massive amount. Jack had been born spontaneously 9 days early and that hadn't been a problem for him or us, and by now I was huge, heavy, swollen and a tad fed up to be honest! On the 1st my mum came over to stay. She'd agreed to look after Jack for us while I was at the hospital and while Mark was either with me or at work. She kept me company all day, distracting me from the thought of the induction the day after. I spent the day hefting heavy loads about, cleaning and tidying, shopping and cooking a roast dinner. Not because I had started "nesting" but because I knew that doing similar had set me off with Jack and the way I figured it was "anything to help this induction speed up". It clearly worked.... Around 2am-ish I woke up for my usual middle-of-the-night-and-need-to-pee-100s-of-times-coz-i'm-pregnant wee. Shortly after that I was up again to tend to Jack who'd cried out in his sleep a couple of times (it was a really warm night, and he was back in his cot instead of his big-by bed since my mum was staying in his room while she was over). By then I was wide awake... I nodded off about an hour after that but was awake again after just half an hour with back ache. And then every 20-25 mins after that with the same. By 5am I had given up and came down stairs to find some pain killers. At 6am they hadn't even taken the edge off, and it was time to start getting ready for the hospital anyway so I went to wake Mark up and also to tell him that I had been having contractions... which where now between 2 and 7 minutes apart and lasting between 20 second and a minute and a half. The look on his face was a picture as he dragged himself out of bed muttering "Whhaa? What? Is that good?" He got Jack up and sorted out while I got washed and dressed, mum got up too and I told her that I seem to have started on my own after all. She asked what I was going to do? Had I called the hospital yet? I hadn't. Mainly because I wasn't sure what to say. I was booked in anyway... But I gave them a call. Explained everything and asked what I should do. They said to come to delivery instead of mat ward and to come as soon as I liked. I said I might as well come in at 8am as planned, since it would take that long to get sorted now anyway. We were in the delivery suite just before 8am and I was examined/given a sweep. 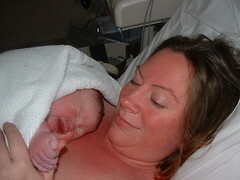 The midwife couldn't quite determine what was going on, and baby still seemed quite high up. So she went to get a second opinion from the the second midwife. When she examined me, she accidentally burst my waters! And announced that I was actually 8cm dilated already! We were told that our baby could easily be with us before lunch time! I had been given gas and air by now (the examinations had been quite painful for me so they'd let me have it for the second one) and was happily puffing away on it so from here on it gets a tad fuzzy. My contractions were getting closer together and much stronger. I asked about pain relief as, in a bit of a daze I'd managed to leave my birth plan at home (not that it mattered since I had re-written it for an induction which was clearly now not going to happen) and said that I'd had meptid last time, could I have it again if I wanted it later? They said they'd see how I went on. By the time I did feel the need to ask for it I was told that the baby would BE HERE BEFORE it had time to kick in! That came as a bit of a shock because I'm pretty sure I recall the meptid being fairly fast acting. Mark was being amazing. He stayed by my side the whole time, passing me drinks, mopping my brow, letting me crush the bones in his hand (which I wouldn't let go of, I couldn't face the thought of a contraction without something to cling onto. Poor hubby, it was him or nothing). The midwives were telling me that we were close, but that when I felt the urge to push I was to do it slowly and follow their instructions. I assumed this was to reduce the tearing as last time I had a 3rd degree so it was important that this time I was careful (I'd had a conversation with my health visitor a few days earlier where she said that women tear more these days because midwives aren't allowed to slow down the birth by pressing baby's head anymore. So babies come out faster and tear the mum). This wasn't actually the reason in the end, but I'll come to that. The pushing sensation came, and I started to feel burning and really really wishing I'd insisted on the meptid a little earlier. During a break in my now very painful contractions I involuntarily reached down, and felt something resembling a jellyfish in texture. I was told that was baby's head! I couldn't believe it! Baby was wriggling about a bit and I could feel the movement inside, and out.... very very strange but utterly wonderful! Our baby was almost with us. A couple more pushes and baby was born. We were told we had a son! But we didn't get to hold baby right away.... the midwife cut the cord and whisked the blue bundle off to the resus table (Mark had commented when we came in that he didn't like seeing those machines, he didn't want to think about having to use one. I'd said I was happier that it was there, just in case!). I heard a gurgle and saw limbs move so wasn't worried too much. Mark had turned a ghastly shade of white... I kept glancing from table to Mark and back again, reassuring him that baby was fine, I would hear the gurgles and so on. All Mark heard was something about there not being any oxygen. He kept seeing the time tick by on the clock. After only a few minutes - which seemed like forever - we were handed our son. A bit blue, but alive and well! We were instructed to keep his limbs moving to help them turn pink and give him lots of cuddles. We were instantly in love! 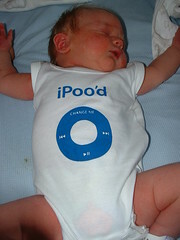 Apparently his cord had tangled around him for a few minutes during the birth. Enough to make him need some attention just to make sure he was ok, but not enough to do any actual harm to him. This, I assume, is the reason why I had to push him out slowly... so I didn't choke him. What matters though, is that baby Thomas Neil Walker was here, and alive. 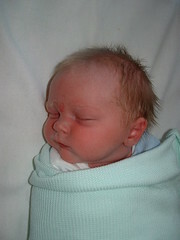 He was born at 11.17am, less than 3 hours & 20 mins after I arrived at the hospital. He was weighed at 9lb 8oz so a little lighter than his big brother, but still a nice big healthy weight! I got a 2nd degree tear this time, nothing like as bad as last time. Quite neat and shallow by all accounts. In fact they brought in a trainee to sew me up - not something they would have done if I resembled a train wreck! I just couldn't get over how fast it had all happened. I had arranged for various people to get updates from me via text for FaceBook and the Pregnancy Forum, and other than my telling people "baby is coming on it's own after all, off to the hosp" I hadn't had time to up date with anything else before he was here! It was 4pm before they let me up on the ward, mainly because it took me a while to manage a pee. Once I was settled in Mark went home to help my mum sort Jack's tea out and so I could have a rest. He came back with my mum and Jack was the evening visiting time, and Jack seemed as smitten with his new brother as the rest of us! I was put in a room with 3 other mums who all went home that evening so I got the whole place to myself! Very nice! I was kept in because of the whole Gestational Diabetes thing, they needed to keep tabs on Tom's blood sugar levels just to make sure he wasn't suffering at all. Naturally they were perfect (because I DIDN'T HAVE GD!). Tom learned to latch on for a feed straight away. He was pooping and peeing normally. He kept my up pretty much all night wanting to be snuggled and loved (how could I refuse!?) but next day I was told I could go home! So as soon as Mark finished work he, my mum, and Jack came to pick us up and we came home. We're now settled nicely into our new routine. Jack has accepted the new baby very well indeed (he's very concerned when ever Tom cries, and likes to give him toys and kisses), Tom's starting to sleep at night and be awake in the day instead of the other way round. The midwife made her first home visit and deemed us all fit and well enough to be left to it for a few days without constant supervision. All in all, it's going pretty damn well!